Abstract. Forest ecosystem models based on heuristic water stress functions poorly predict tropical forest response to drought partly because they do not capture the diversity of hydraulic traits (including variation in tree size) observed in tropical forests. 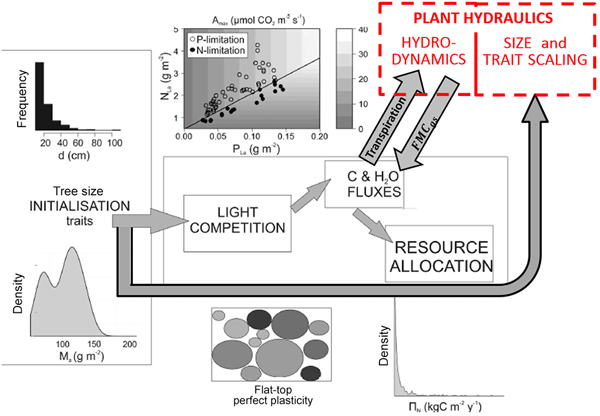 We developed a continuous porous media approach to modeling plant hydraulics in which all parameters of the constitutive equations are biologically interpretable and measurable plant hydraulic traits (e.g., turgor loss point πtlp, bulk elastic modulus ε, hydraulic capacitance Cft, xylem hydraulic conductivity ks,max, water potential at 50 % loss of conductivity for both xylem (P50,x) and stomata (P50,gs), and the leaf : sapwood area ratio Al : As). We embedded this plant hydraulics model within a trait forest simulator (TFS) that models light environments of individual trees and their upper boundary conditions (transpiration), as well as providing a means for parameterizing variation in hydraulic traits among individuals. We synthesized literature and existing databases to parameterize all hydraulic traits as a function of stem and leaf traits, including wood density (WD), leaf mass per area (LMA), and photosynthetic capacity (Amax), and evaluated the coupled model (called TFS v.1-Hydro) predictions, against observed diurnal and seasonal variability in stem and leaf water potential as well as stand-scaled sap flux. Our hydraulic trait synthesis revealed coordination among leaf and xylem hydraulic traits and statistically significant relationships of most hydraulic traits with more easily measured plant traits. 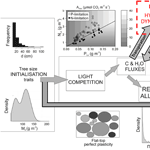 Using the most informative empirical trait–trait relationships derived from this synthesis, TFS v.1-Hydro successfully captured individual variation in leaf and stem water potential due to increasing tree size and light environment, with model representation of hydraulic architecture and plant traits exerting primary and secondary controls, respectively, on the fidelity of model predictions. The plant hydraulics model made substantial improvements to simulations of total ecosystem transpiration. Remaining uncertainties and limitations of the trait paradigm for plant hydraulics modeling are highlighted. How to cite: Christoffersen, B. O., Gloor, M., Fauset, S., Fyllas, N. M., Galbraith, D. R., Baker, T. R., Kruijt, B., Rowland, L., Fisher, R. A., Binks, O. J., Sevanto, S., Xu, C., Jansen, S., Choat, B., Mencuccini, M., McDowell, N. G., and Meir, P.: Linking hydraulic traits to tropical forest function in a size-structured and trait-driven model (TFS v.1-Hydro), Geosci. Model Dev., 9, 4227-4255, https://doi.org/10.5194/gmd-9-4227-2016, 2016. We developed a plant hydraulics model for tropical forests based on established plant physiological theory, and parameterized it by conducting a pantropical hydraulic trait survey. We show that a substantial amount of trait diversity can be represented in the model by a reduced set of trait dimensions. The fully parameterized model is able capture tree-level variation in water status and improves simulations of total ecosystem transpiration, showing how to incorporate hydraulic traits in models.